To escape an approaching comet the Jupiter 2 crew blasts off from the planet that has been their home for the past twelve months. Thanks to Dr. Smith's carelessness, the robot is sucked out the airlock but later re-united with the Robinsons as a mysterious spaceship captures them all. Again thanks to Smith the prisoners onboard the ship are freed and incite a riot. John, Don and the robot repair the ship's chronometer and the grateful prisoners are released, allowing the Jupiter 2 and its crew to resume their travels, still lost in space. This episode must have come as a surprise to the faithful viewers who had watched Lost in Space the previous two seasons. Gone was the opening narration; new costumes appeared, for once the robot was behaving like a responsible adult not a babbling idiot, and the Jupiter 2 could fly again. Look carefully at the opening scenes on the planet and you'll notice the sand around the campsite is gone. This was done to facilitate the "spacewalk" scenes but is glaringly apparent. 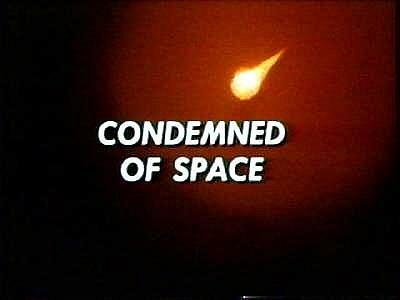 Irwin Allen hoped to re-create the feel of the first season's opening episodes, hence the liftoff, comet, spacewalk, and capture by an alien spaceship. Even the music is borrowed from the first season. The "hero' robot costume makes its premiere in this episode as B9 takes his first spacewalk, which was featured in a September 1967 TV guide article. Don and John explore the alien spacecraft on their own as they did in the Derelict. Will leaves the ship without his parents' permission as he did in the same episode two years earlier. Robby the Robot, star of "Forbidden Planet" makes his second (and last) appearance in Lost in Space, this time as a prison guard, sporting a new flat black paint job with yellow pinstripes and, if you look carefully, a missing right antenna. The Robinsons exit the Jupiter 2 through the landing leg hatch but how do they (especially the robot) do it? There is a yellow ladder but was that extended from the Jupiter's hatch or already on the Vera Cassel? The robot computes that there are 8,974 prisoners on board but the TV audience never sees more than ten or twenty at one time (still a lot of extras for an epsiode of Space) for obvious monetary reasons. Robby freezes Major West with a gun that is merely a fire extinguisher with a handle attatched. Dr. Smith is almost killed by the criminal Phanzig in a violent, realistic scene, but minutes later Smith starts sneezing while on the criminal's pedestal, proving he can still act silly. He also plans to fly the Vera Cassel back to Earth, so he's still full of lofty schemes as well. The scene where Don is interrogated is well-written, acted and filmed. Mark Goddard gets to do something besides react for a change. John fixes the Time Lapse Chronometer (can't just call it a clock, huh?) which paroles all the prisoners, and Phanzig says thank you by giving Will the cat's cradle he had used to almost strangle Smith minutes before! At the end of the show when the Robinsons have departed the Vera Cassel, the lower deck viewport is open and used effectively in a humorous scene involving Smith and the robot. Gone are the cliff-hangers from the last two seasons, replaced by a sixty second preview of the next week's episode. These were removed during TV syndication but thankfully restored in all their glory in the Columbia house VHS collection. This episode features an excellent combination of action, new special effects and genuinely funny comedic scenes that work together very well. And besides, anything with Robby the Robot as a guest star is worth watching! Another HOT comet? Didn't anyone point out that error to the writer & producer the last time in "The Derelict?" Smith wants to abandon ship when the Jupiter is in trouble, but in the most noticeable continuity error in perhaps the entire series Smith cries "But we have no lifeboat!" and Don replies "Your spacesuit's your life boat." No mention is made of the Space Pod though it appears in the very next episode. Why? "Gosh it's a comet and it's headed this way!" Notice the lack of sand on the set. 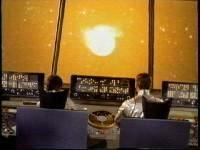 The Jupiter 2 crew faces the killer comet. The result of "an abnormal Smith"-B9 makes his first (and last) spacewalk. Professor Robinson attempts to rescue the robot as his anxious family watches. John and Don meet Robby the Robot for the second time, this time as a pinstriped prison screw. Will and Smith leave the Jupiter against orders and explore the prison ship. "Have I frightened you, master?" Phanzig gets Smith in a chokehold. Major West gets the cold shoulder from Robby. The Time Lapse Chronometer is fixed thanks to John and his magic screwdriver.